A Common Redpoll, one of several “northern finch” species that sporadically invade the conterminous U.S. With this study, perhaps those irruptions could be predicted in the future. It was 2 winters ago that we had an incredible redpoll invasion. I’d never even had one in my yard before, and we’d lived in South Dakota for 20 years. 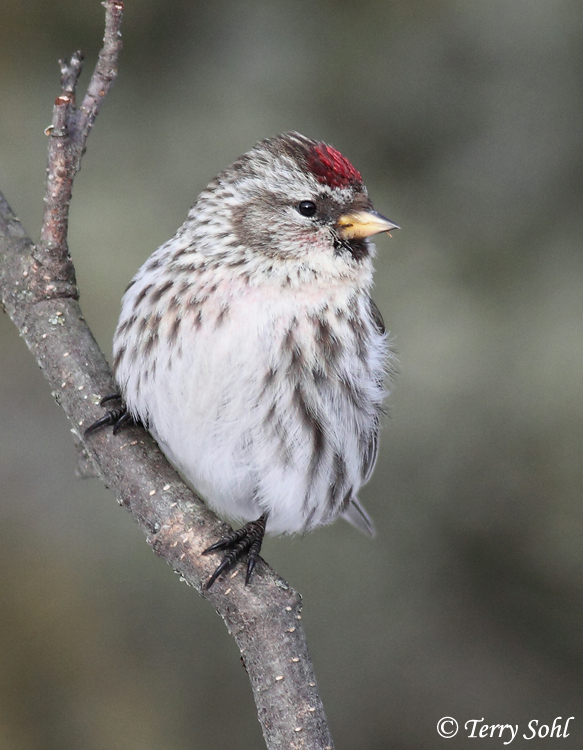 However, in the winter of 2013/2014, we had Common Redpolls around for several months. A real thrill when one, and then another, Hoary Redpoll showed up at my feeders and stayed for a couple of weeks. Such events are always a surprise, and it’s not just Redpolls. Both Red and White-winged Crossbills are equally unpredictable winter invaders across the U.S., as are Pine Siskins and Evening Grosbeaks. It was generally understood that large movements southward in the winter were due to poor seed crops for pines and spruces further north. A new study from the University of Utah attempts to explain the winter invasions, based on climatic variables. First, the study finds that favorable climate patterns tend to shift across the continent. When one region is favorable to seed production, other parts of the continent are more likely to have unfavorable conditions for seed production, resulting in periodic movements in birds as they key in on areas with the most food resources. The other climate finding is that it may be possible to predict irruptions to south up to two years in advance! Seed production itself tends to be correlated with favorable conditions 2 or 3 years PRIOR to the actual growing season. So, for example, if 2015 has unfavorable climate conditions in much of Canada, it may mean reduced seed production in 2017, resulting an increased likelihood of a southward irruption of northern finches. One of the things I love about birding is the total unpredictability, as you never know what you may see when you head out, but it would be cool to be able to anticipate a great winter finch season. One final aspect of the work I like…they relied very heavily on eBird data. A GREAT resource, but one that really isn’t being used for research nearly as much as other, more established monitoring programs like the Breeding Bird Survey. If found the eBird data to be invaluable for the bird/climate/land-use study I published, and I think you’ll see more papers like this finch study use eBird data in the coming years.